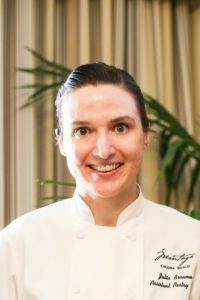 Julia Browne is the assistant pastry chef at Montage Laguna Beach, where she has worked with Executive Pastry Chef Lee Smith for the last five years of her 13 years in the resort’s pastry department. She first began baking at Montage Laguna Beach as a banquet pastry prep chef in 2005 and helped with opening the baking banquet department for Montage Beverly Hills in 2008. From breakfast pastries, crème brûlée, cakes, mousses, sauces and garnishes to macarons, ice creams, tarts, wedding cakes and teaching baking classes on-site, Browne is a diversified pastry pro who creates recipes, helps manage the team and assists in overseeing all sweet banquet requests. Prior to Montage Laguna Beach, she was a baker at Café 225 in Visalia, Calif. She graduated from the Greystone CIA Napa baking and pastry program.